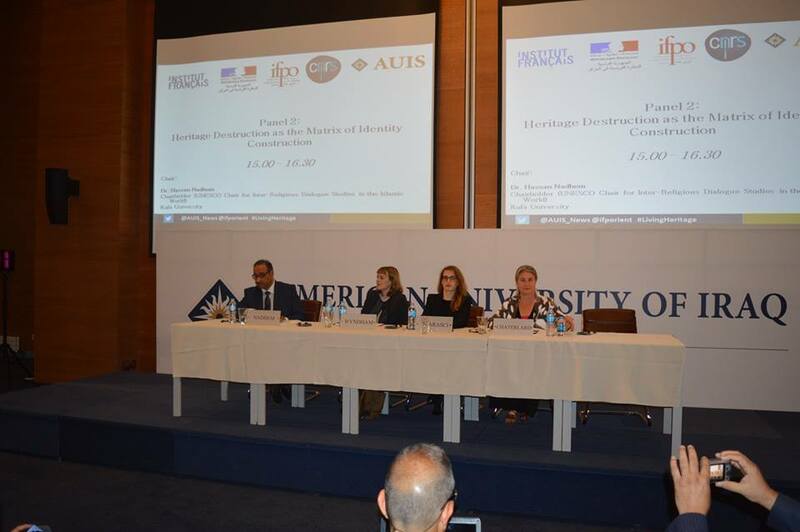 The French Institute in the Near East (Ifpo) and the American University of Iraq, Sulaimani (AUIS), Host a Conference of Living Heritage – 10th – 11th May 2016. UNESCO Chair at the University of Kufa participated in a conference in Sulaimania – Iraq on 10th-11th May 2016, entitled: “Conflict and Living Heritage in the Middle East: Researching the Politics of Cultural Heritage and Identities in Times of War and Displacement”. This was co-organized by The French Institute in the Near East (Ifpo) and the American University of Iraq, Sulaimani (AUIS). The organizing committee included, Dr. Geraldine Chatelard from Ifpo (Amman), Dr. Boris James, head of Ifpo in Erbil branch, Dr. Elizabeth Campbell, assistant professor at AUIS and Dr. Hassan Nadhem the Director of UNESCO Chair at University of Kufa. The conference included a panel discussion on the current crisis and conflict in the Middle East, Iraq in particular. Speakers analyzed questions about living heritage and how collective identities are affected by civil conflicts and authorities of new political parties, in countries such as Syria, Iraq, Libya and Yemen who have been targeted as a result of war. The aim of the discussions looked at heritage has helped in a time of war, the role of government institutions in safeguarding the heritage in case of political unrest, as well as the role of the extinction of cultural identity of indigenous minorities, the program covered an array of topics highlighting the importance and significance of a living heritage in practice and in discourse.